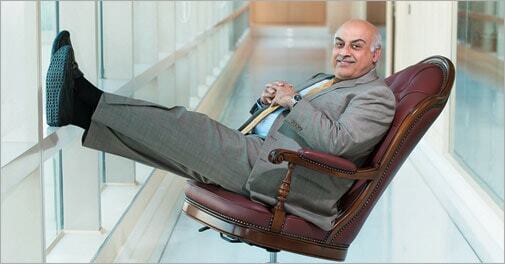 Vivek Chaand Sehgal went on an acquisition spree on the road to becoming India's largest auto component maker. It wasn't exactly the best time to seal big business deals. The world was still reeling from the shock of Lehman Brothers going bankrupt, companies were cutting costs or laying off staff - and people were definitely not buying. But Vivek Chaand Sehgal was different: the chairman of auto component maker Motherson Sumi Systems Ltd (MSSL) was making audacious plans while the rest of the business world lay low. In September 2009, he closed a e26.5-million (Rs 200-crore) deal to buy out VisioCorp, a financially troubled UK-based rear-view mirror maker. Sehgal took a huge risk. Motherson's entire profits were wiped off by the mirror company's losses in the next quarter itself. VisioCorp's then CEO wanted two years to turn around the business. But Sehgal was impatient. He replaced the CEO with his freshly graduated son, Laksh Vaaman Sehgal, who was then flirting with Internet music start-up Saavn. He still has an investment in the project. Within the next three quarters, the mirror company was making operating profits. The father and son broke VisioCorp into several units and then worked on a unit-by-unit turnaround. "We wouldn't have lasted two years if we had continued to make losses," says Laksh. Sehgal's gamble has paid off. In just the past few years, MSSL has grown more than 10 times times into a Rs 25,225-crore company from just Rs 2,595-crore in 2008/09. MSSL, the flagship company of the Samvardhana Motherson Group, did business worth Rs 31,000 crore in 2012/13, with the mirror business accounting for Rs 8,880 crore of group revenues. MSSL has grown at an annual 75.63 per cent the past three years, and the group plans to close 2013/14 at Rs 35,000 crore. With numbers like that, Motherson is India's largest auto component maker, way ahead of rivals such as the Ashok Minda Group and Anand Group. Most large automobile companies such as Daimler, Volkswagen, Toyota and Maruti Suzuki are Sehgal's customers. The Motherson group has 227 companies that make about 800 auto components. Ask Sehgal about Motherson's peers in the industry and he says: "I have no peers." It's a long way from the time Sehgal started the auto component business in 1983. For years, 80 per cent of the company's revenues came from supplying parts to Maruti Suzuki before Motherson charted a new course in 1995/96. The company then decided it would not focus on either one company or one product, and no customer would account for more than 25 per cent of its turnover. In line with the new strategy, it acquired Irish wiring harness company Wexford Electronics for e330,000 in 2002. Since then, it has acquired about 15 companies and today is present in 25 countries. "Sehgal's model is aggressive and inorganic, and there is no one else who has done this," says Vinnie Mehta, Executive Director of the Automotive Component Manufacturers Association (ACMA). By the end of the decade, he had decided it was time to revisit the strategy. The board then decided that no customer or component would account for more than 15 per cent of turnover. He has almost achieved that goal - Volkswagen, Motherson's largest customer, is the only exception and accounts for 20 per cent of sales. This is because of Motherson's e141.5-million acquisition of German automobile interiors maker Peguform in 2011. Seventy-five per cent of Peguform's revenue came from Volkswagen, which increased the auto maker's exposure in the Group. "In the new 911 Porsche Carrera, the complete interiors are done by Motherson," says Sehgal. Both VisioCorp and Peguform were large acquisitions which Sehgal says were made at the behest of his customers. Daimler wanted Sehgal to acquire VisioCorp and promised him contracts. Later, Volkswagen suggested Sehgal buy Peguform because the owners wanted to sell the company, which wasn't doing well. Both the companies were in a bad shape, but are now profitable and contribute huge amounts to MSSL's revenue. So far, everything Sehgal has touched has turned to gold. He first made a fortune when the American billionaire Hunt brothers were buying silver from all over the world in the early 1970s. An 18-year-old Sehgal, whose grandfather was a famous jeweller, then transported silver to the airport and earned a rupee per kilo. The trips fetched him Rs 2,500 every month, which was a small fortune at the time. "It was more than what my father was getting from the government at that time," says Sehgal. That was the start of his journey. In 1975, Sehgal formed a company with his mother called Motherson and started silver trading. By the end of the decade, the Hunt brothers had gone and it was time for Sehgal to move on as well. The silver merchant then turned into an auto component maker. Motherson formed a joint venture with 400-year-old Japanese firm Sumitomo Electric to make wiring harnesses for Maruti Suzuki, which had just started production in 1983. Little did Sehgal know that three decades later he would be heading an auto components behemoth. "He has the ability to look at what opportunities are coming his way and make use of it," says Maruti Suzuki Chairman R.C. Bhargava, who has known Sehgal for years. Sehgal says he has acquired his values from his mother. He isn't flashy and isn't visible at most industry association dinners, except one two years ago when he was invited to talk to young entrepreneurs, says an ACMA member. He did not give any management lessons at the event, but quoted from the Bhagwad Gita. He recites his morning prayers without fail and has a temple in every factory. Motherson has grown 1,800 times in the past two decades despite a string of crises along the way. Sehgal says the company has successfully survived the worst of times - two Asian crises, Y2K, the 9/11 attacks and the Lehman Brothers collapse. It got listed in April 1993, and since then has made shareholders richer. A Rs 2,500 investment in 100 shares then is worth Rs 22 lakh today. Dividend payouts are also impressive: Motherson has been paying 40 per cent of its profits as dividend for the past 20 years. Sehgal has raised money only once by diluting 10 per cent of equity. "That is only possible if the team is extremely focused," says Sehgal. "The vision of the group is what everyone has to follow, you cannot deviate. You cannot get into aerospace or health care." Sehgal stepped down as managing director in 1995 with the idea of creating an institution run by professionals. It was important for him to get out of the day-to-day running of the company. The family's role is to see the company does not deviate from its vision and stays committed to serving auto makers. Even Laksh, he says, is not an executive working with the company, but a director on the board. Sehgal says the vision will remain the same until 2020. He has no reason to change things for now. For years, Motherson has met its targets every time. To celebrate, Sehgal throws a party he calls GDP, or Get Drunk Party, every year. This year, Laksh says, the party will be a special one. "Dad will for sure set a big number (the target for the next five years) and he will make the rest of the team buy into achieving the target," he says.